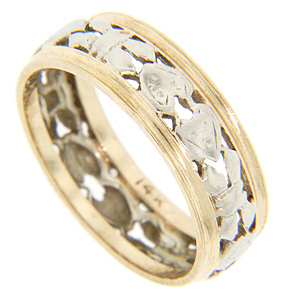 Double hearts and bow designs done in white gold decorate the center of this 14K gold vintage wedding band. Yellow gold edges frame the central motif. The wedding ring measures 6mm in width. Circa: 1950. Size: 6. Cannot be resized.